Three reasons to check out 'Burnouts' – AiPT! A silly book that doesn’t take itself too seriously, but can also be surprisingly deep. Dennis Culver’s Burnouts is a surprisingly deep comic book. While the story seems like a simple one, it manages to go beyond its simple trappings. Thanks to great character development and appropriate art, the book is more than just a wacky adventure starring drug-abusing high school students. Here are three reasons you should check out Burnouts. In today’s society, everything takes itself so seriously. Even the silliest movie seems to have some sort of message, television is filled with shows that seem to have a weekly “very special episode,” and everyone’s social media account seems to be filled with deep thoughts. Whatever happened to a pointless and fun screwball comedy? Burnouts never takes itself too seriously. 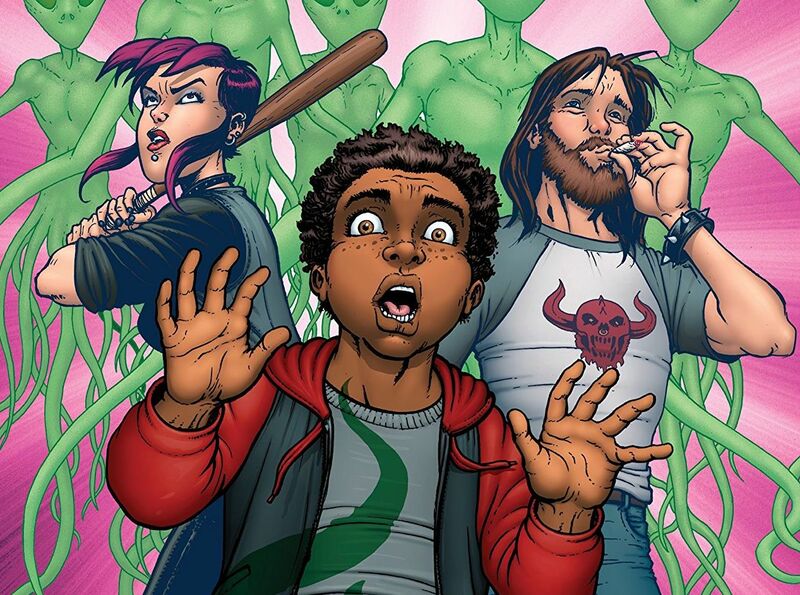 The story is about a group of kids out to save the world from an alien invasion only they know about. And what gives them this knowledge? They are able to see the aliens after smoking enough marijuana, of course. Filled with little green men, cow tipping, and plenty of drinking and smoking, Burnouts is a fun little comic that is not out to teach us more about ourselves. This is not about telling a deeper story. It’s all about having fun. Just because the story sounds like the plot of a B-horror movie, though, doesn’t mean it’s all fluff. The biggest knock against Burnouts is it has a paper thin plot. The premise can only be taken so far, right? After a strong first issue, Burnouts does run into some growing pains. This is a story involving high school students, aliens, and weed. There’s only so much you can do. This is evident early on when it is clear writer Dennis Culver is trying to pad the story. Culver’s characterization of the burnouts is spot on, however the story is somewhat lacking. It’s not long before Culver finds his voice and once he does, Burnouts becomes a very fun book. Mixing elements of 1950s sci-fi film schlock, over-the-top horror movies, and the even strong emotion, Culver turns Burnouts into a very engaging read. The closing moments of the book are surprisingly tense and powerful. Burnouts is a lot of silly fun, but there are layers to it. Culver may have taken a while to find his voice, but artist GEOFFO has handed in great work since the first issue. Initially, the art takes on a cartoony, comic strip-like look. It fits the tone and mood of Burnouts and adds to the story. During the middle of the story, Burnouts almost becomes a showcase for GEOFFO’s work. When the story starts to lack focus, the one thing readers can count on is the art. GEOFFO keeps the same playful look as it slowly evolves over the course of the story. The art begins to take on a darker and more mature look. As Burnouts heads into its final moments, GEOFFO’s work becomes grittier. Colors become a darker and there is a greater use of shadows. The art never loses its Sunday morning comics look, but it definitely feeds into the story’s darker mood. 'Burnouts' escapes its seemingly simple premise to tell a silly and action-packed story. Great art adds to the comic.